Steve Rogers is the National Watercolor Society Purchase Award Winner “Best of Show” at the 2006 NWS Annual Juried Exhibition. 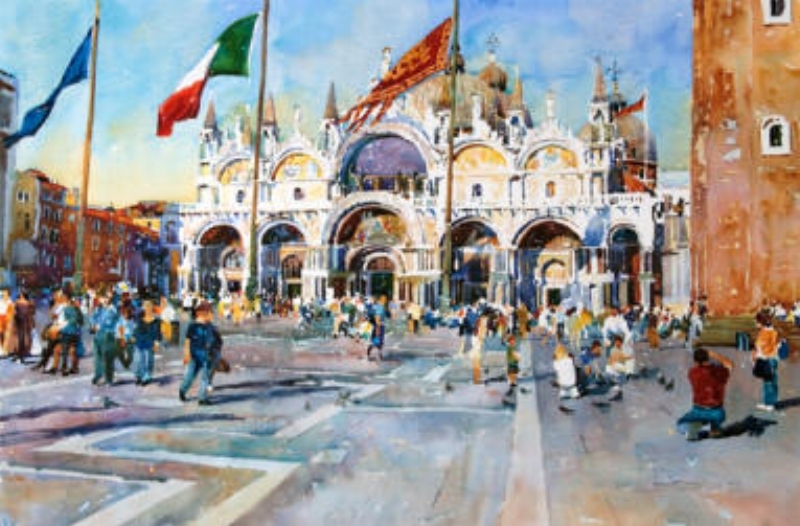 Steve’s paintings have won hundreds of awards in juried competitions including four awards in the American Watercolor Society Annual Internatoinal Exhibitions. Steve Rogers was born August 18, 1947 in New York City. He attended Rollins College in Winter Park, Florida, and graduated with a Bachelor of Arts degree from Monmouth College in Monmouth, Illinois in 1969. His father, Henry Rogers, was a commercial artist who would often paint at home when Steve was a child. He studied in New York with artist Harold Stevenson,who would go on to found the prestigious Stevenson Academy of Fine Art, and later with legendary watercolor painter and instructor Robert E. Wood. Steve has made a career of painting since 1975. He lives at 26 Sunset Boulevard, Ormond Beach, Florida 32176 Ph. (904)441-4930, with his wife Janet, both of whom are Signature Members of the American Watercolor Society. Steve traveled to Greece for the first time in 1992 to teach a watercolor workshop and has returned to Greece and Italy, Spain and France many times since. These experiences have had a profound impact on the color, the sense of light and place, and overall direction of his painting. “God is light” I John 1:5. I paint the light, which is a reflection of God’s beauty, and it makes my work as an artist both joyful and rewarding. .Thank you for submitting your online registration. CLICK HERE to print the registration form. Mail this form and your check to Barbara Otey. No refunds after September 10, 2018.